Diamond tools are utilised for a number of surface preparation tasks. 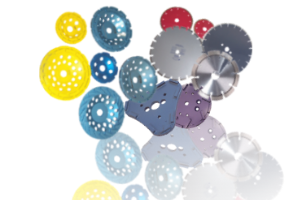 SPE supply a vast array of cup discs, cutting blades & diamond grinding blocks specifically designed for the surface preparation industry. SPE Diamond Cup Discs - designed for superior performance and long grinding life. The SPE range of dry diamond cup grinding heads are suitable for general concrete grinding, paint removal and providing an excellent textured finish for follow on protective coatings and repair materials. Single Row, Double Row and Turbo designs are available.